Many times it so happens that there are plenty of mango tree flowers but no fruits, so what to do if the tree does not produce fruits. Causes of premature and untimely fall of mango fruits from the tree are discussed and the tips to prevent fruit dropping. Improper watering, fertilizer and diseases may be the reason of deflowering in mango, banana trees and other fruit trees. When my young mango tree in its 3rd year, it produced about 25 fruits for the first time, it was a matter of joy and excitement for me. I used to watch them daily growing slowly. But after a few weeks, I noticed about half of them fell down after a storm. I was very sad to see that ultimately only two mangoes matured, but both were very very tasty! The question is in spite of so many flowers, the tree do not produce fruits because most of the fruits drop at an early stage. What causes premature fruit drop? When I saw tiny baby mangoes falling from tree prematurely, then it was a matter of concern, however fruit drop in mango tree, specially in a young mango tree is quite common. When the mango tree begins to fruit, you will see a large number of tiny mangoes on the stalks, but most of them fall as they grow. Don't worry, this is natural. The natural question is why mango fruits fall down in the garden prematurely? There are several causes of fruit drop as discussed below. The initial falling of mangoes from stalks is quite common and not due to any insects or other problem . A tree cannot support all the heavy fruit set, only a certain percentage of it can mature to full size fruit. Dropping of some mango fruits is a normal thinning process of tree to properly utilize the available nutrients. The immature fruits are all competing for the available food and water. The strongest will survive. There are, however, many factors that may be responsible for the tree to shed its fruits. The weather, dry weather or too much rain, high temperatures, inadequate soil moisture, lack of pollination and ovule abortion, embryo degeneration, pests, insects, diseases, lack of fertilizer, failure of fertilization, wrong time of fertilization and low photosynthate level can cause the young fruits to fall off . Getting right amount of water is an important factor for the growth of a mango trees. Too much water can cause fruit dropping prematurely. Note that a mature mango tree do not require frequent watering. For a young tree, water about two times a week in the first year and thereafter after 4-5 days. Mango trees grow well in warm tropical climates. However, a mature tree can withstand low temperatures. Cover the tree to protect it from frost. Do not prune dead branches if the frost continues. The mango tree fruit may fall if there was a cold weather during bloom and fruit set. The cold damages the developing embryo in the seed, due to which the ethylene gas given off by the damaged embryo causes fruits to drop before maturity. Another reason for premature dropping of mangoes from a tree is improper or over fertilization. Use a complete fertilizer developed for fruit trees, with correct ratios of nitrogen (N), phosphorous (P) and potassium (K). Fertilise your tree with a fertilizer that has a higher P and K ratio. Too much nitrogen will damage flowers. You can also give an organic fertilizer to feed the tree. Regularly add organic compost to the plant. Severe pruning of the mango tree may reduce fruit production for many fruiting cycles. Pruning should, therefore, only be done to remove broken or diseased plant stems and leaves. Mango Diseases & How to Treat Them? The mango fruits fall off the tree due to some tree problems. Fungal disease such as anthracnose, Gummosis, sooty mold, and powdery mildew  on the tree can cause premature dropping of mango fruit. The anthracnose disease attacks all parts of the mango tree making black spots on leaves, flowers and even fuits (video on how to control black spot disease on mango tree), but does the most damage to the flower panicles, so it is the most dangerous disease resulting in less or no fruiting. Due to anthracnose, the infected mango fruits drop early from the tree and fruit that initially appears unaffected quickly decays upon ripening and also the tree start losing leaves. Due to powdery mildew fruit, foliage and stems are covered with a white powdery substance, whereas anthracnose causes dark spots on leaves. As the fallen diseased twigs, leaves and fruits on the ground are a potential source of infection, never allow them to remain on the ground for too long. Prune dead branches and leaves from the tree regularly to avoid any disease to the tree. Dispose of all infected parts of the plant in the rubbish or burn them. Keep the area around the plant as weed free as possible. Use a fungicide if the fungal problem persists. If the tree is already affected by anthracnose, and/or powdery mildew infection, it is too late to spray for these now. To avoid these fungal disease problems in the future, spray trees when they begin to form flower spikes. For anthracnose, spray a copper fungicide and use a sulfur fungicide for powdery mildew. The Mango anthracnose can be controlled by an organic spray of garlic or ginger or turmeric. Grind and add to water with some liquid dish washing soap. About 50-70% of the mango fruits fail to mature and fall off because of the formation of abscission layer in their stalks, known as fruitlet abscission. Abscisic acid (ABA) is possibly involved in fruitlet abscission. The abscission is result of fruit complex physiological phenomena during the first 3-4 weeks after pollination and accounts for over 90% loss of set fruitlets . If you can identify the cause of your premature dropping of the fruit, then you can try to isolate the cause and treat that to stop fruit dropping. Then how to prevent mango flowers and fruits from falling? The fruit drop in mango tree can be controlled by applying some hormones. Spray of some hormones on blooms ensures fruit setting. Naphthalene Acetic Acid (NAA) and Gibberellic acid (GA3) are the most effective for improving fruit retention. In a study in Ghana, the spray of GA3 (25 ppm) and NAA (25 ppm) resulted in increasing fruit set, fruit retention, fruit weight and yield . Initial fruit set was substantially increased when sprays of 200 mg/l indole acetic acid (IAA) were applied to developing panicles [6,7]. On a study on Australian Kensington Pride mango, polyamines spray Spermine (SPM) (0.01mM) onto the mango panicles at full bloom stage resulted in reduced heavy fruitlet abscission and improved fruit yield . 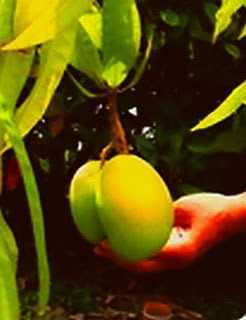 If you follow the following tip, I am sure you will have a very good crop of healthy mangoes. I am following this tip and my mango tree is producinged several mangoes every year, each weighing more than 300 g.
Tip: Fruit drop in mango can be controlled by a spray. As soon as you see the mango flowers to appear, spray the flowers with eco oil or pest oil, every week on flowers and growing mangoes. Continue this until the fruits grow to a large size, stop the spray at least 2 weeks before you intend to cut the fruits from the mango tree. How can you use the fallen unripe mangoes? Use them in coriander-mint chutney. Peel, chop and use them in salads. Peel, chop an use them in sweet mango chutney. Use them in making a mango drink, known as Pana in India. Pana drink is beneficial in summer. Nkansah, G.O. and T. Ito, 1994. Effect of air and root-zone temperatures on physiological characters and yield of heat-tolerant and non heat-tolerant tomato plants grown at different root-zone temperatures. J. Jpn. Soc. Hort. Sci., 64: 315-320. G.O. Nkansah, J. Ofosu-Anim and A. Mawuli, 2012. Gibberellic Acid and Naphthalene Acetic Acid Affect Fruit Retention, Yield and Quality of Keitt Mangoes in the Coastal Savanna Ecological Zone of Ghana. American Journal of Plant Physiology, 7: 243-251. Singh, J.N. and S. Ram, 1983. Studies on the use of plant growth substances for fruit retention in mango cv. Dashehari. Indian J. Hort., 40: 188-194. Singh, Z. and L. Singh, 1995. Increased fruit set and retention in mango with exogenous applications of polyamines. J. Hort. Sci., 70: 271-277.